There is something quite wonderful about a vintage style wedding. It gives us a lovely sense of nostalgia and provides a type of elegance and grace that is often missing from the more ostentatious styles sometimes chosen these days. Bigger is not always better, and less is sometimes most definitely more! Of course, vintage can mean pretty much anything that is not of this day. When we think of vintage wedding dresses, for example, there are so many styles to choose from. From the 1920s flapper style and the 1930s floor length draping gowns to the fun style of the 1950s with their tight bodices and multiple petticoats and the 1960s where pretty much anything went! And its probably best that we don’t mention the 1980′s meringue! Obviously, a wedding is always a joyful occasion, but perhaps it was even more so back in the day, particularly around the 40s and 50s. It was a chance, during difficult times, to think optimistically and put troubles to one side for a while. People would pull together to put on a great wedding celebration, in spite of the lack of money, using skills to “make do and mend”. These were the days when everyone knew their neighbours and families still lived in the same towns and villages, not halfway round the world. Everyone was there, on hand, to do his or her bit to make the day go with a swing. A romantic notion in this age of the wedding planner! Lets get back to the vintage style wedding – think village church, trestle tables, street/garden party, hand picked flowers, bunting – it all sounds a bit Darling Buds of May, but you get the picture! You might want to take at our Vintage Weddings Pinterest board for some more vintage inspiration. Recently, “traditional” has become very fashionable. Vintage style wedding gowns, and lace in particular, have been much in demand since the marriage of Prince William and Catherine Middleton in 2011. The dress worn by the now Duchess of Cambridge was simple, yet stunning. It wasn’t in the least bit showy or over the top. It was demure and majestic – perfect for the occasion! And very much of the style we associate with bygone years. Generally, the use of lace for a wedding dress is very clever. It allows the semi-reveal of areas of the body that some of us would rather cover up, like the arms, for example. The long sleeves of the Duchess of Cambridge’s wedding gown would keep even the most arm-phobic bride happy! Here are some examples of some incredibly sophisticated wedding dress styles that embrace the use of lace and have the classic and elegant look of eras gone by. We love them and hope you do too. Back to the vintage wedding! All sorts of things can give your wedding a vintage feel. Perfectly orchestrated weddings these days have everything done in a regimental, coordinated style that automatically gives a formality to things. Matching bridesmaid dresses, shoes, flowers, matching table decorations, table settings, glasses etc. When you opt for vintage, you can be a bit more free and easy with your choices. For example, you might not be able to get perfectly coordinating containers for your table decorations – so a variety of receptacles would give a quirky feel to things. We just love this little teapot bursting with beautiful flowers. 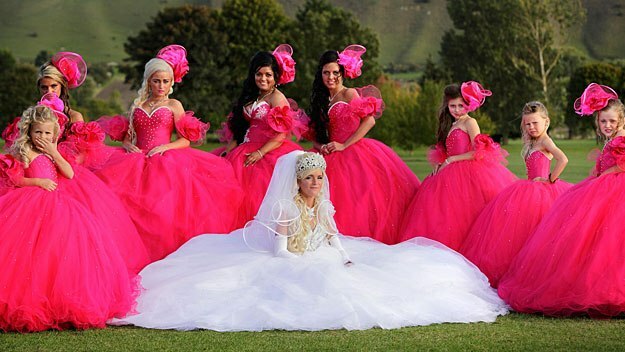 You may dress your bridesmaids according to what suits each one individually, opting just for a matching colour, rather than have them all identical whether they can all carry off the look or not. Your table settings may be made up of plates and cups and glasses etc that you have gathered from various sources. Even the tables and chairs do not need to match. If everything mis-matches, it works – really! This can save you a fortune as you can borrow from people or pick bits up from charity shops or car boot sales. If you are looking for ways to keep costs down, have a look at our article on Weddings on a Budget, which focuses on wedding flowers on a budget, for some more ideas. It really is easier than you think to create a beautiful wedding setting, like this pink themed one, whether indoors or outdoors. Props make everything magical and really set the scene. Fresh flowers always look glorious, and the use of ivy and roses on these plate settings looks wonderful. If you like the idea of using props, but don’t have time to trawl second hand shops and boot sales, much least be left with all the things you have collected after your big day, you could consider hiring them. There are companies that hire out a whole array of useful items. White Wedding Post Box have beautiful white vintage postboxes – great if you have asked your guests to give donations to your honeymoon or deposit for your first home. Plus there are many other companies, like Vintage Wonderland in North West England and Bowtop Vintage in South East England that have just about everything you can think of to hire to make you feel like you have stepped back in time.